Let the author take you through a healing guided imagery. 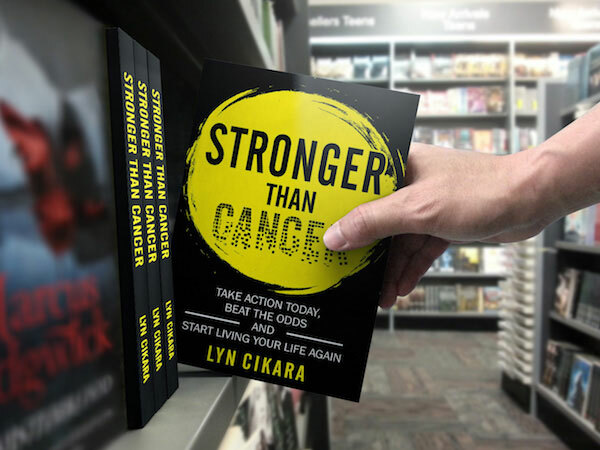 Lyn Cikara is the best-selling author of Stronger than Cancer, a book aimed at giving people affected by this diagnosis hope and practical strategies to live empowered. It is the antidote to negative statistics and the fear that a cancer diagnosis instills in family, friends and the individual alike. The book was written to empower people with simple, daily strategies and practices that restore control and the ability to live life fully again. Its focus is to put the individual back at the head of their team of healers. All reviews on Amazon speak to the practicality, humor and personal anecdotes making this book a valuable resource for anyone going through a life-threatening diagnosis. Link to 55-minute interview with Lyn Cikara where she presents advice on how to deal with cancer holistically. Select the “play” button in the audio box on the bottom of the Conscious Talk page. It was also exactly what I really needed right now, as I coach my father through his struggle with cancer and his final days on this earth. As a breast cancer survivor, I have found Lyn’s book to be very uplifting, while at the same time helpful in a tangible way. This is exactly the kind of book I needed – not more facts and figures, but words of wisdom, anecdotes, and strategies. I recommend Stronger than Cancer most highly! Facing a diagnosis of cancer puts one into a state of shock and Lyn Cikara’s STRONGER THAN CANCER is a great roadmap to navigating the steps through that shock plus the shock waves that result from navigating the treatment course with such a disease. After my own diagnosis of appendiceal cancer, I have found her book has been extremely helpful to me in balancing the fear with finding some calm.